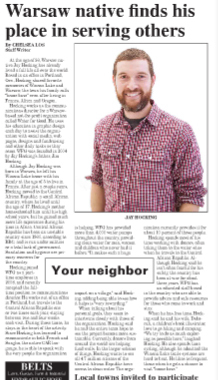 Jay Hocking, communications director for Water for Good, is featured in this week’s the paper, the free tabloid shopper that is distributed in Kosciusko County, Ind. (Water for Good is a cooperating organization in the Fellowship of Grace Brethren Churches.) A portion of the article appears below. Click here for the complete story (on page 2). At the age of 36, Warsaw native Jay Hocking has already lived a full life all over the world. Based in an office in Portland, Ore., Hocking shared favorite memories of Winona Lake and Warsaw, the town his family calls “home base” even after living in France, Africa, and Oregon. Hocking works as communications director for a Warsaw-based not-for-profit organization called Water for Good. He uses his education in graphic design each day to assist the organization with social media, web pages, designs and fundraising and other daily tasks as they come. WFG was founded in 2004 by Jay Hocking’s father, Jim Hocking. Click here for the complete story (on page 2). Also see WARSAW NATIVE FINDS HIS PLACE IN SERVING OTHERS at InkFreeNews.com to read the complete story.